Ilkeston batsman Rob Green deals with a delivery against Marehay on Saturday. Another wonderful weekend for Ilkeston Rutland saw their first XI maintain their promotion thrust with a rare win over Marehay and the third XI reach their first ever cup final. The omens may be good for the first XI. Not since the last time they were promoted to the Premier League in 2007 have they beaten Marehay and especially pleasing will have been the batting display against a side that normally causes collapses. It wasn’t the smoothest of starts. Put in to bat, they lost last week’s run machine Kevin Leatherday to only his second delivery but after that David Smit and George Moulds began to find the boundary in a 60-run stand. Moulds was removed for 25 by James Kyte whose testing spell kept Luke Marriott on zero for 19 balls. Once off the mark, Marriott began to boss proceedings. Smit had slipped into an accumulative phase, eager for his deputy to have the strike and Marriott unfurled ten boundaries and a six in a rapid 63. Rob Green kept up the momentum with 29 and, poised at 193 for 3 with ten overs remaining, a score of close to 300 looked possible. Marehay fought back by taking wickets – the most crucial being Smit for a workmanlike 88. There was time for a breezy 21 from Danny Shelton before Rutland were bowled out for 249 in the 50th over. The intention of the visitors was clear from the start. 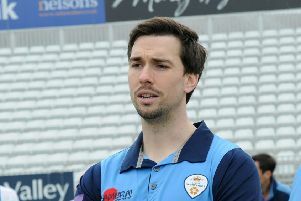 Opener Kyte launched his first ball for six over mid-off and Rutland needed to hold their nerve against the onslaught. Chris Trueman Jnr did just that, having Ben Perry Taylor playing on for six and clean bowling Ben Gartside, a cup centurion at the Rec earlier in the season, for one. Marehay’s run rate remained on course courtesy of Kyte’s clean hitting but George Moulds cleaned him up for 42. Rob Peat (65) then took over the role of aggressor and, to Marehay’s credit, they remained determined to chase the target despite the loss of wickets. It was Sam Moulds who settled the game with a three wicket burst, including Peat, from his first 16 balls of the season. The 3rd XI’s cup record is nothing to shout about. In 14 seasons, they have only twice made it past round one but this year it’s payback time. A terrific team effort took them through to the final of the Harry Lund Cup after wins against West Hallam and then Spondon on Sunday. The quarter-final found them overhauling West Hallam’s 128 thanks to a hard-hitting 54 from Shafqat Amin and some cool last over batting from Joel Howes and James Fearnside. In the semi-final they looked in trouble against Spondon losing four wickets for 34 but they were rescued by the scampering Lee Bradley whose unbeaten 43 was complemented by some lusty blows from the bats of Bryan Smith (21) and Joel Howes (25 not out). Defending 132 was easier once Tom Lowe (3 for 21) removed the Spondon top order. More wickets from Grant Robertson (3 for 19) and Howes (2 for 31) saw Spondon close 15 runs short. Rutland now take on Rolls Royce in the final. On Saturday, the 3rd XI came away from a trip to Belper with a losing draw after being set a colossal 268 from 40 overs to win. Grant Robertson’s unbeaten 113 ensured respectability for Rutland who ended on 180 for 6. There was another positive result for the 2nd XI, this time against Division Five North leaders Rolleston. Put in to bat, they were in deep trouble at 31 for 4 but a brilliant unbeaten 129 from Damien Jones changed all that. He put on 71 in partnership with Vic Pilbeam and then added 109 with Lewis Jones, whose 63 came off 30 balls. Having put themselves in a position to win the game, Rutland let themselves down with some sloppy catching as Rolleston closed on 211 for 6, 46 runs short of their target.